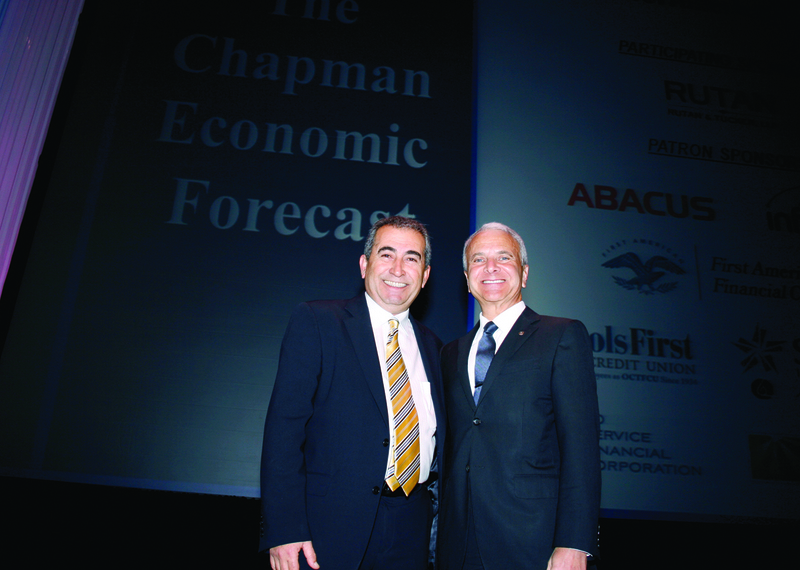 Esmael Adibi (right) and Jim Doti will present Chapman University’s mid-year Economic Forecast Update on June 12 at 8:30 a.m.
James L. Doti, Ph.D., president of Chapman University and Bren Distinguished Chair in Business and Economics; and Esmael Adibi, Ph.D., director of Chapman’s A. Gary Anderson Center for Economic Research and Anderson Chair in Economic Analysis. Please join us to attend and cover one of Orange County’s major annual business events: Chapman University’s mid-year Economic Forecast Update, issued by the A. Gary Anderson Center for Economic Research. This presentation updates and revises the university’s Economic Forecast presented last December. The Update will review the December 2012 Forecast and project trends through the year 2014. Chapman University’s Economic Forecasts are based on a comprehensive database and an econometric model developed by Chapman faculty and students. Researchers gather historical and current economic data on a quarterly basis. More than 200 equations are factored into the economic model and integrated using theoretical principles of economics and econometrics. 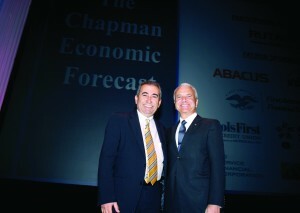 Presented to the Orange County business community for more than 30 years, the Chapman University Economic Forecasts achieve a high degree of accuracy and are respected by business people, community leaders and business media. if you would like to attend and cover. Embargoed copies of the full report are available by email (embargoed until 10 a.m. June 12, 2013). The media registration table will be located just outside the Concert Hall. A continental breakfast will be available in the Concert Hall lobby beginning at 7:30 a.m. Parking is free in the Center Tower Structure (corner Sunflower and Avenue of the Arts), the Plaza Tower Structure (corner Anton and Park Center Dr.) and the Park Center Structure (corner Sunflower and Park Center).